This show takes place on a superbly chosen Bring Your Own Venue, outdoors in Granville Island’s Sculpture Grove, which lends it a sense of enchantment. The first thing I noticed when I arrived, taking my seat at the edge of the wooden walkway, overlooking the grove and, beyond it, Alder Bay, was three beautiful and intricate horse masks tied to the tree right in front of me. I was reminded of Shakespeare’s A Midsummer Night’s Dream which also takes place in an enchanted forest. But far from Shakespeare’s wordy script, crude animal inclusion, and chaotic fairy enchantments, Theatre Terrific’s choice of soundtrack and venue for this show lent it a graceful and natural enchantment. 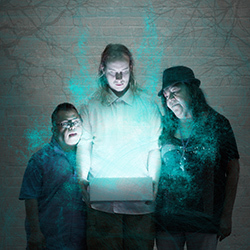 Theater Terrific is an inclusive theatre company that engages artists of all abilities and addresses universal issues. Hidden Stories emerged from the collaboration between Theatre Terrific, Aboriginal Front Door, and the Carnegie Community Centre to explore what is hidden behind our everyday faces. Led by Bill Beauregarde, who performed in the piece and assisted Susanna Uchatius in its direction, the cast discovered their animal spirit in the process of going through the Cree Medicine Wheel. The four directions of East, South, North, and West are honoured in the Medicine Wheel and inspired the premise of the play forming the foundation for its movement and transformation. In addition to the horse masks, there were other kinds of masks hanging from various trees in the grove – masks belonging to other hoofed animals, feathered animals, furred animals, and clawed animals. One cast member made their appearance as a scaled animal – a fish – and initiated the movement of the other four cast groupings through the grove to the beat of a drum. These four groupings initially moved around without masks, then with. Without masks, each cast member’s movements were more isolated from their grouping. Donning the masks built a recognizable sense of camaraderie, community, and belonging that spread from group to group across the four cardinal directions, leading to the casts’ more robust, purposeful, and unified movement as animal spirits than their movement had been as humans. As if in agreement with this transformative assessment, the weather even shifted from cloudy to increasingly sunny as the play progressed. This was a serene performance and is a great show to relax to, just a few steps away from the Fringe’s typical hustle and bustle in more central areas of Granville Island.